My doctor is so conscientious. He made out this steroid wean sheet for me on my last visit. I’m making my way to Day Zero. 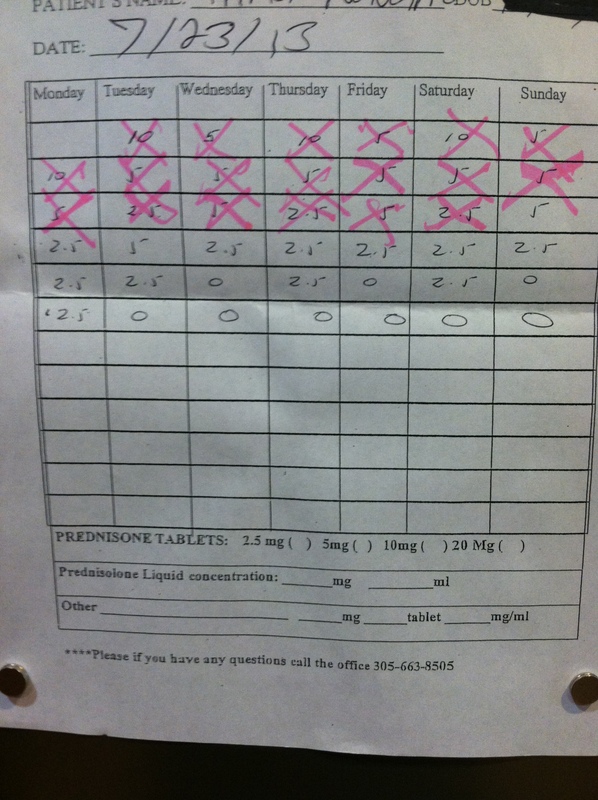 As I slowly say goodbye to my frenemy, Prednisone, my body is realizing something’s up. This is a for-keeps kind of thing. I suppose it needs time to adjust. And it has started sending me signals, namely via hands and ankles. Since I have a sore right thumb, I’ve taken to Ace-wrapping it, and of course my hand, for the night. Two mornings ago I woke up with a very painful left hand, but my right was A-OK. I thought nothing of it, unwrapped my hand and got up to meet my day. I massaged my left hand at intervals and it took several hours for the pain and stiffness to go away. RA’s signature. At the end of the day it hit me. Warmth. I’d kept my right hand warm encased in its Ace wrap all night. There was visible swelling along the base of the metacarpals, a definite RA calling card. But, it didn’t hurt and it didn’t affect my mobility. Aha! I thought. What took me so long to figure that out? Nurse heal thyself. I’ve had these gloves for many years and they still give my hands and wrists great support when I sew or quilt. Since I was already in bed when the revelation hit me and my other Ace wrap had been left in my office, I opened my bedside drawer and grabbed my sewing glove. This morning my hands felt equal. A little stiff, a little swollen, but barely sore. And most importantly, functional. And what makes me feel warm all over? Blowing on her nails after Na did them. Another reason I need agile hands. 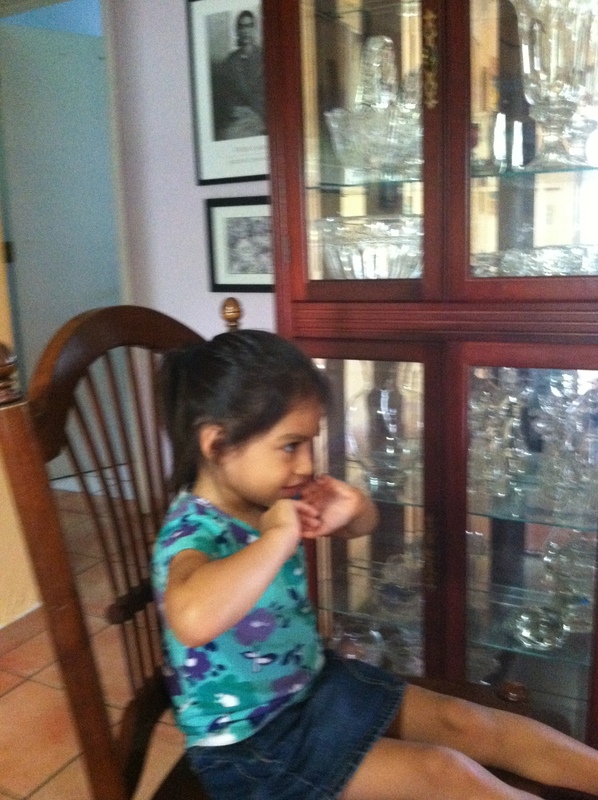 To give my baby her manicures! 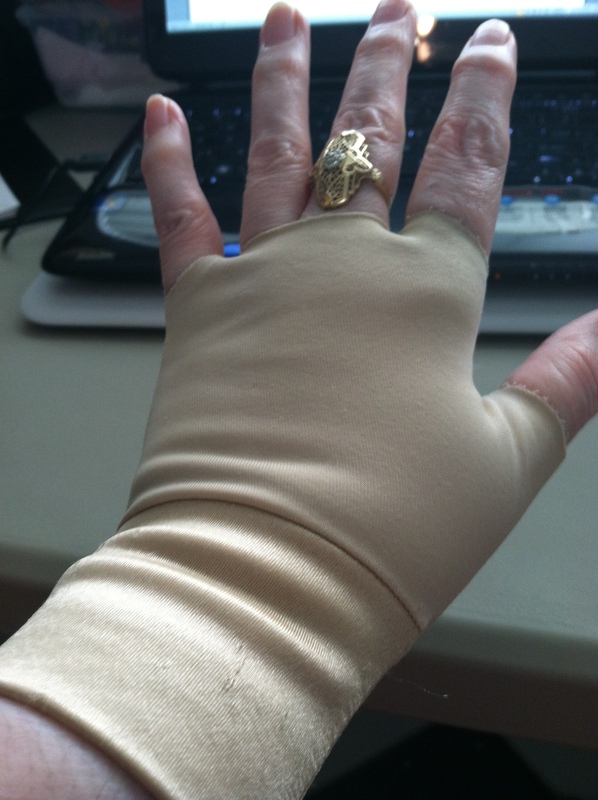 This entry was posted in Blogging, Health, Inflammatory conditions, Life, Love and tagged Ace wrap, Handeze support gloves, Inflammatory conditions, Metacarpus, Prednisone on August 10, 2013 by Irma. Good luck with decreasing your Prednisone. I totally understand how much a “pain” that can be, but I am happy to hear you have equal hands today! Enjoy the rest of your weekend. Thanks, Nicole. It is nice to have equal hands! Hope all is well with your boys. Wishing you a great weekend! Thanks Irma. The boys are doing better, Thank you. Have a wonderful night!